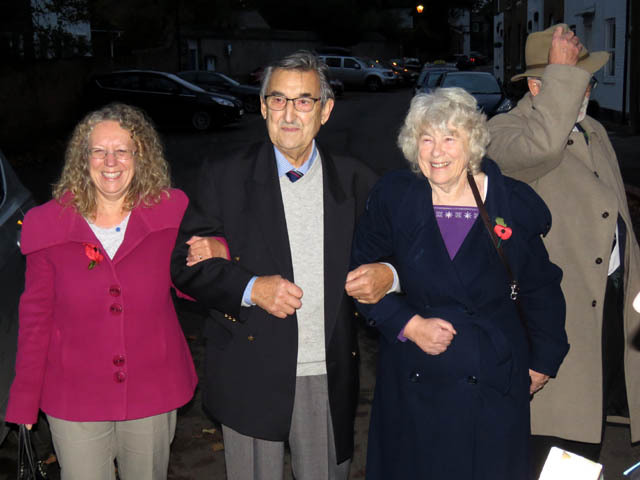 Patricia, Annie, Michel, René and Louis-Jacques joined us for our Remembrance Sunday commemorations this year. 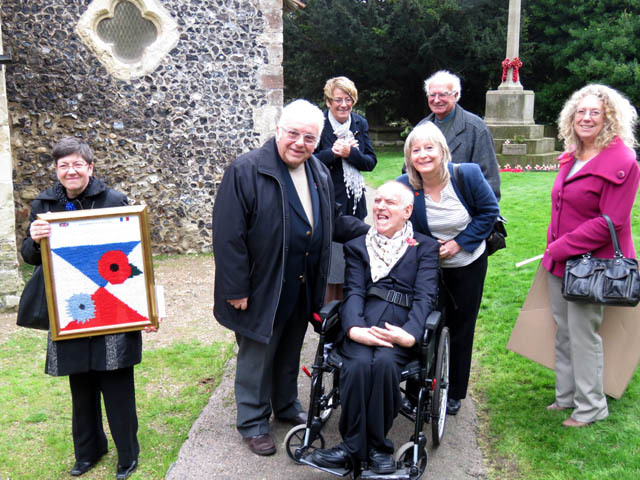 Paul and Val offered early morning hospitality of tea, coffee and breakfast to the French guests on their arrival in Eastry before convening in Church Street for the parade to the church. 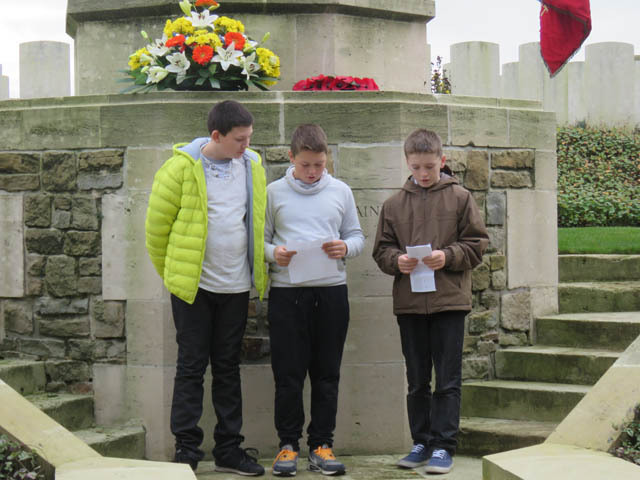 The ceremony, much loved by the visitors from Longpré because of the involvement of all the groups and organisations, got underway on schedule, wreath laying by the various organisations and the names of the fallen read out by the vicar. 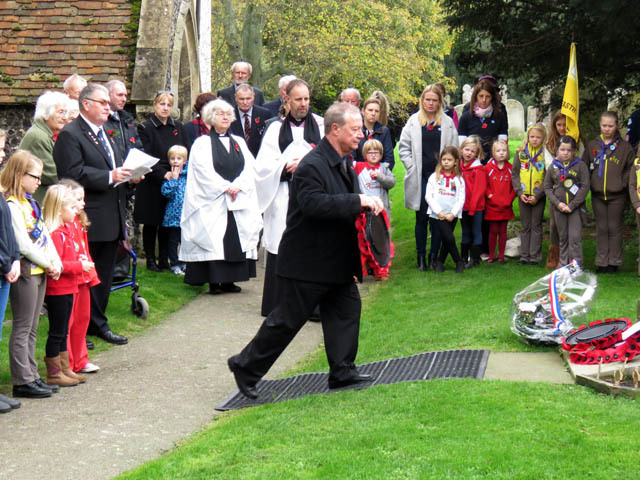 Timed to perfection for the period of silence, broken by the sounding of Reveille and the striking of the church clock at 11:00 am. 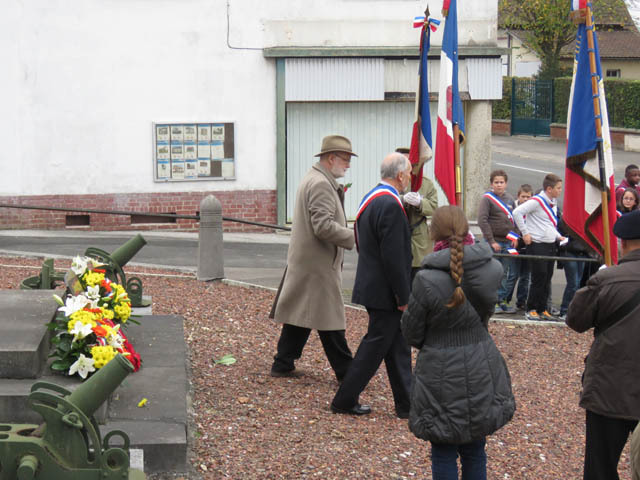 Paul, one of our newer members placed the wreath on behalf of the Twinning Association, and Louis Jacques presented the floral tribute from Longpré. The congregation then proceeded into the church for the service. 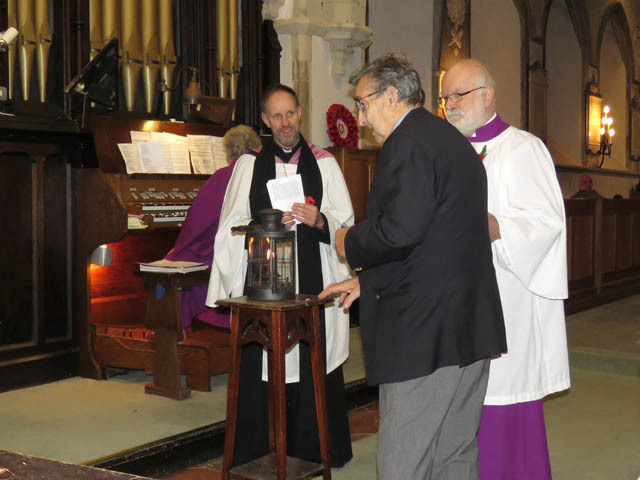 René was invited forward to light the 1st WW lamp that he had generously given to us previously. 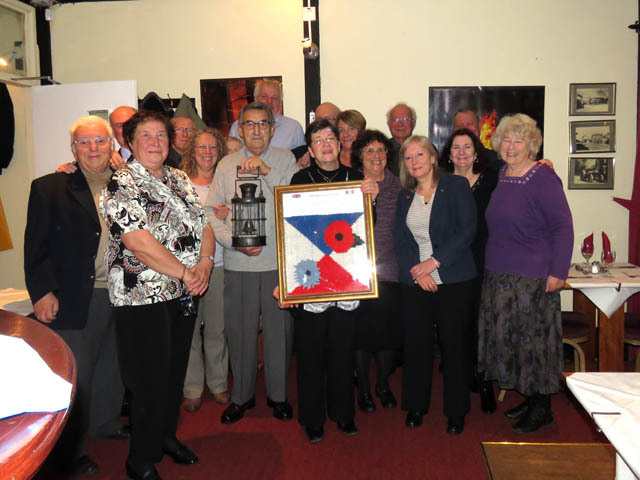 The lighting of the lamp by René was a special moment, as was the presentation to Patricia, President of the Longpré-LCS jumelage (twinning association) of an embroidered picture of a poppy and cornflower, symbols of the battlefields of France, made by Eastry House resident, Leslie. Leslie is an enthusiastic embroiderer and was pleased to be asked by Teresa to make the gift for Longpré. It took many hours to complete and the pleasure it gave to both maker and recipient was obvious to everyone when it was presented during the service. 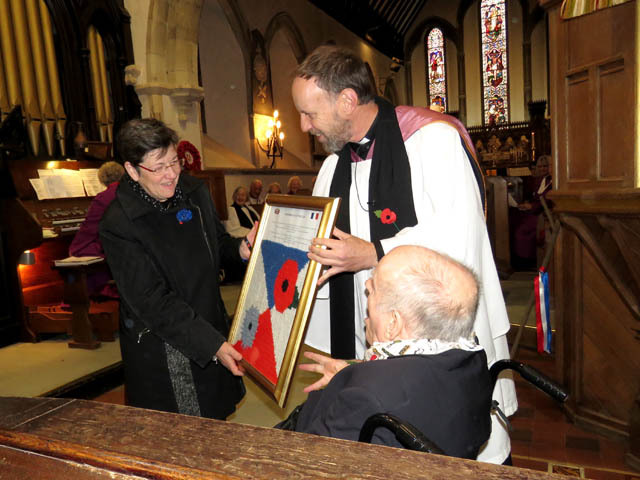 Leslie gives his embroidered picture to Patricia, President for LongpréLCS jumelage. 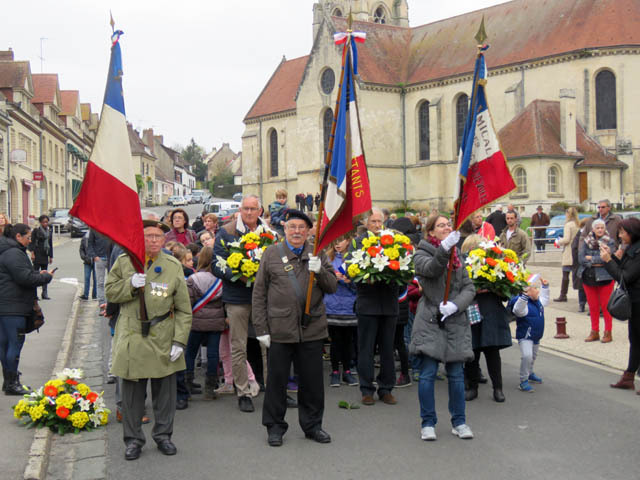 After the ceremony in the church, we took our guests to the 5 Bells for lunch where the time passed all too quickly and before long they were having to set off for their return to France. 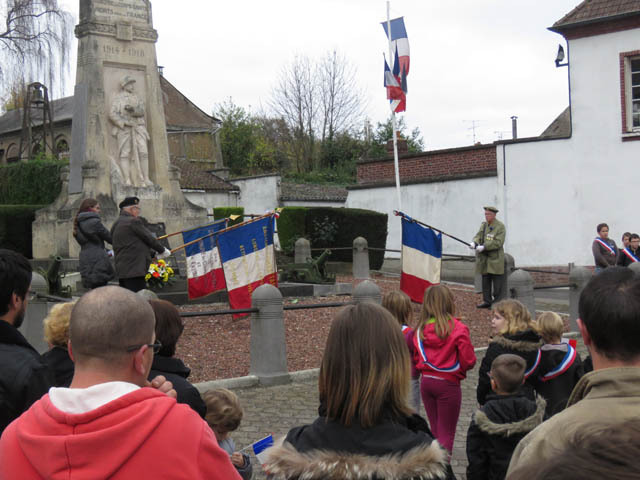 Now a firm fixture in the Twinning/Jumelage calendar, the day was very successful and reinforced the bonds between the two communities. 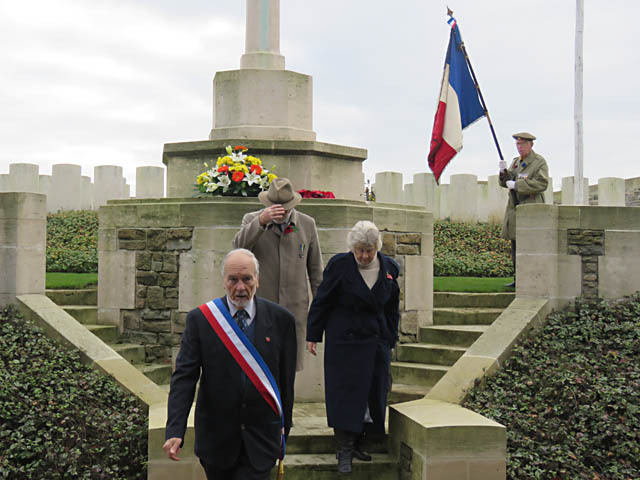 See below for the visit to Longpré-les-Corps-Saints by the Eastry delegation. 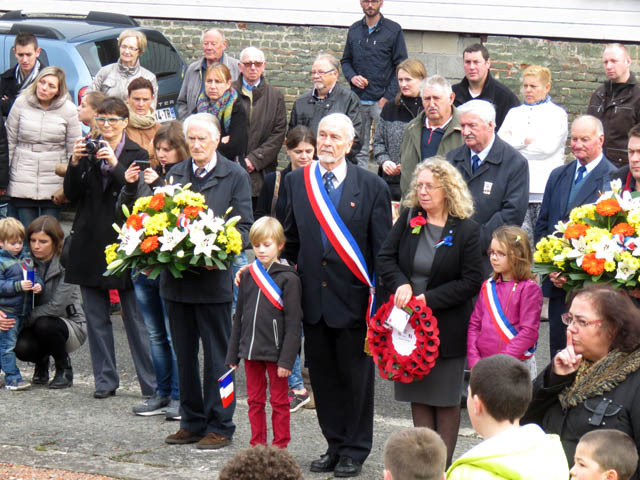 Myself (Nick), Lesley, Bill, Peta and Robin made the usual 5 am start to get the Eurotunnel to France and on to Longpré for Armistice Day. 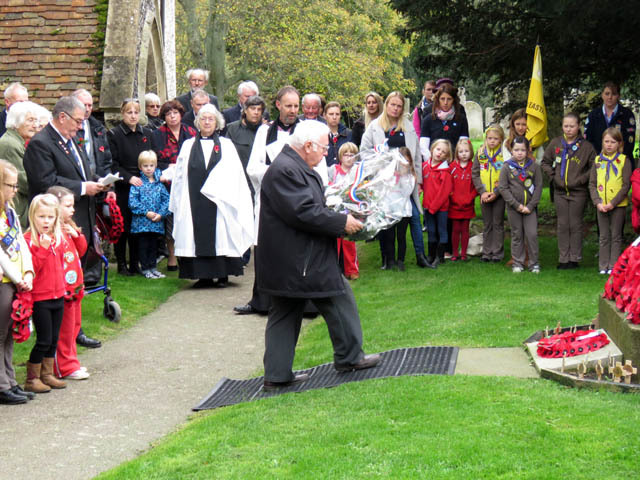 It was a slightly unusual start to the day as we feared we'd not got the necessary wreaths, so Lesley made a brief excursion to the churchyard in Eastry to 'borrow' a wreath from the memorial there. 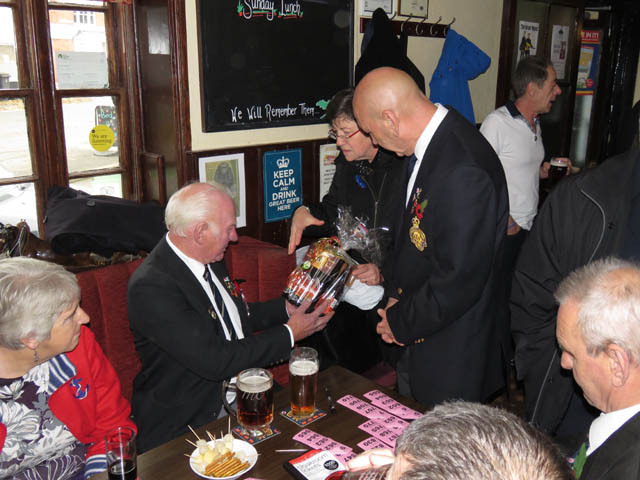 As it turned out, Robin and Peta had the wreaths so the pre-dawn raid was unnecessary! We arrived in plenty of time and were fed and coffee'd by Patricia before the formal part of the day began. 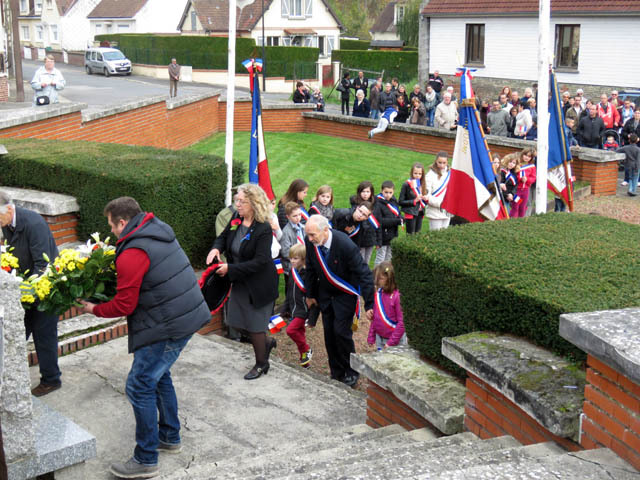 We visited the small British cemetery in Longpré and laid wreaths before returning to the 'Mairie' for the procession to the church. 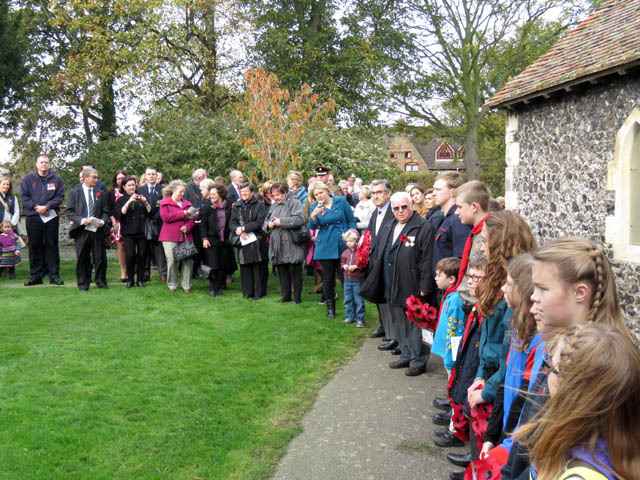 After the service, the congregation processed around the village, with ceremonies at the memorial to the fallen during 1914-1918, and then the memorial to those killed on 5th and 6th June 1940 (see the memorial page). 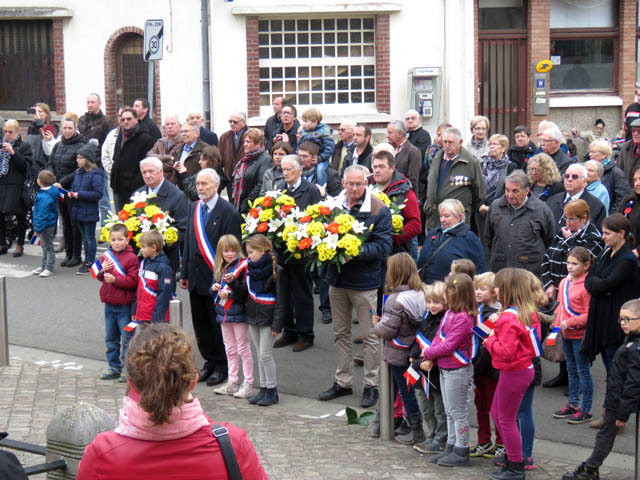 The procession returned to the Mairie where everyone was invited in for drinks and chance to chat to others. 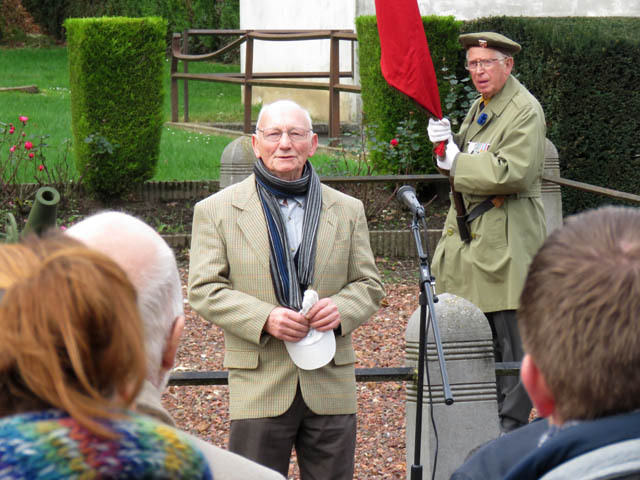 An impromptu rendition of God Save The Queen by Martine's father! 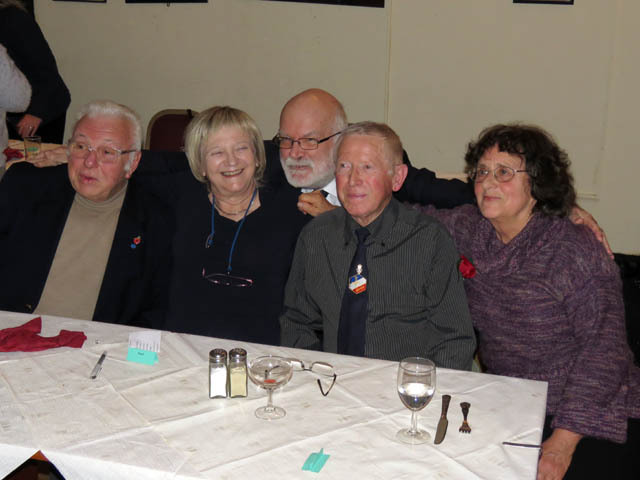 After the reception at the Mairie we went to our respective hosts for lunch and then everyone [René and Paulette with Bill, Monique with Robin and Peta and Martine and Vincent] convened at Patricia's house where Lesley and I had been served an excellent lunch, for the deserts, provided by the hosts. It was a lovely end to a very good day.